780 km of hiking trails, or “Grande Randonnée”, and a network of 2,800 km of smaller trails, enabling you to discover the vast open spaces of the département. 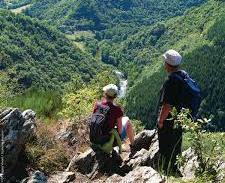 Discover the Aveyron at your leisure. Moreover, some 20 departmental topo-guides enable you to follow the Petites Randonnées itineraries. They vary from a simple walk of perhaps an hour or so to walks that take the whole day. We can advise you on various walks around the Muret and in the Segala. Take advantage of the cool, fresh waters in Aveyron and discover some remarkable natural and beautiful spots. Wander downstream, either alone or accompanied. In Najac (only 20 min from the Muret) you can go canoeing on the Aveyron river. With 7 000 km of waters, plus 38 lakes open to the public, Aveyron is a department where water is always close by. Whether you are an experienced angler or an occasional enthusiast, the Aveyron, with its vast open spaces, will enable you to get back to nature. 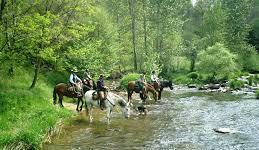 The Aveyron, with its diversity and immensity of the countryside, is an interesting playground for all horseriders. At the Fargues, only 2 minutes from the Muret, Alexandra will be happy to take you for a ride in the neighbourhood. Farm animals, exotic animals or reptiles, there is an animal park for every age and taste in the Aveyron. Children will be albe to feed animals from all over the world at the Jardin des Bêtes or be impressed by the lions at the Parc de Colombier. At the Parc Animalier de Pradinas, they will discover wolves, bears and lynxes. An animal handler presents his work with wild animals and the falconry show will delight young and old. Once back at the domaine, you will enjoy moments of well-being, relaxing near the swimming pool, reading in a cosy corner of the courtyard, swimming in the Muret lake. In the evening, Annette will seduce you with her delicious dishes, prepared with local products or you can just enjoy the incredible sunset from the terrace.